There is a new art form hitting the streets of Chicago, and it is taking the city streets by storm. It involves pop art, real artistic talent and a canvas of corrugated sheet metal. There is something about this metal that adds a whole other level to the fun and cartoonish pop art that adorns it, and it is this novel approach to art that is really impressing the residents of the Windy City. 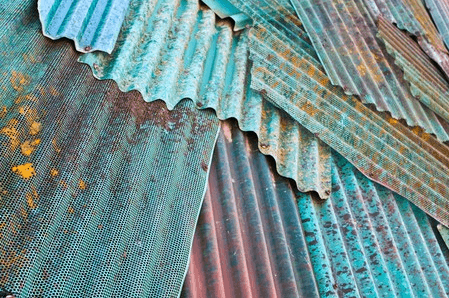 What is corrugated sheet metal? It is simply sheets of hot-dip galvanized steel that is cold rolled, resulting in the metal having a rippled pattern. It is this rippled designed that adds the real character to metal fences – where this corrugated sheet metal is often used and where these unique art pieces are popping up across the city, as Examiner reports. This type of steel is incredibly sturdy while offering a serious bending strength, which makes it popular for use in fencing. Galvanized corrugated steel is also weather resistant, so the walls the art is painted on aren’t at risk of rusting away anytime soon. Even more impressive than the material’s strength and appearance is that this form of steel will make a rumbling sound when you shake it, giving the artwork an additional dimension to entertain viewers both visually and audibly at the same time! In a most impressive example of this pop art style, an epic mural has been created on Chicago’s South Side that shows a fun underwater scene of several vividly colorful characters like the artistically impressive octopus, a bright yellow submarine and even the elusive “dogfish,” depicted as having the facial features of a bulldog and the body of an inflated pufferfish. This art piece has become very popular in the Chicagoland area, and artists in other cities are taking notice. As the fad grows you may find a fine piece of corrugated sheet metal art in your neighborhood very soon. At R.G. Smith Company, we supply all sorts of sheet metals for businesses for a wide variety of needs. From custom-made ventilation or food processing systems to dust collection and insulated wall systems, we can handle anything your business needs. To find out more, call us at our Canton office at 330-456-3415 or in Mansfield at 419-524-4778 today. ← What Is on Your Roof? Article doesn’t say where the Yellow Submarine art is located. We would like to know.